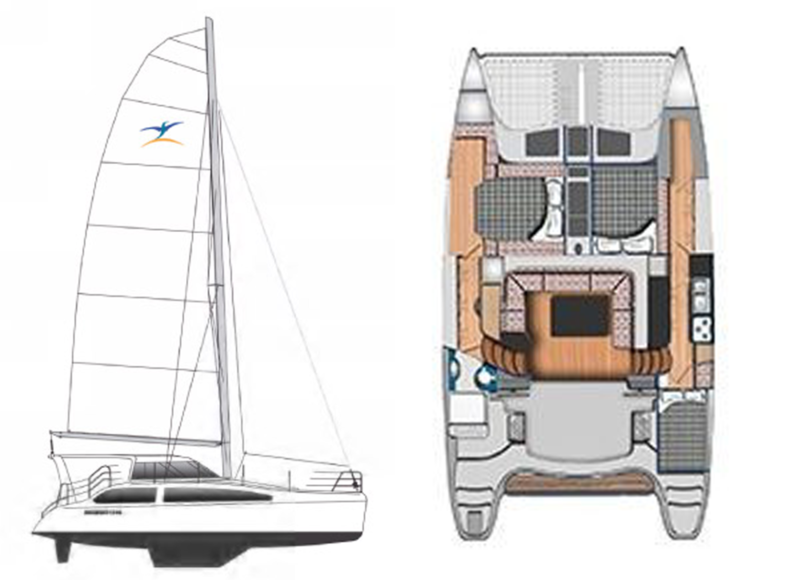 A newcomer to the production multihull scene could easily be led to believe that there are two kinds of large multihulls in this world: high-performance speedsters and relatively heavy-displacement charter-style cats in which performance necessarily takes a back seat to comfort and lounging space. There are, however, any number of other boats out there that offer an appealing balance between theses two extremes—including the new Seawind 1160 LITE. Built by Australia’s Seawind Catamarans at its manufacturing facility in Vietnam’s Ho Chi Minh City, the Seawind 1160 LITE is an evolution on the company’s successful Seawind 1160, of which more than 100 have been launched. For years, Seawind has built its reputation on boats that are not just elegantly styled sailers, but seaworthy in the most demanding sense of the word. As evidence of this fact, in addition to being the go-to multihulls in the Australian charter trade, many of the company’s boats have also circled the globe—including a number of 1160s. For its 1160 LITE the company dialed down the bluewater aspect of the boat by swapping out twin power-tilt 20hp Honda outboards for the pair of diesel auxiliaries with saildrives found on its predecessor. The result is a reduction not only in weight but in maintenance, since you no longer have to worry about things like marine growth on the drive legs or electrolysis, since outboards can be fully retraced when not in use. In addition, the outboards’ smaller size free up more space for storage, while the fact that they can be retracted means zero drag when sailing. Along these same lines, lightweight laminates have replaced the wood joinery found on the 1160 in the interest of reducing weight—a key factor in multihull performance. One thing that hasn’t changed is the build quality. The hulls are resin infused in vinylester with a PVC closed-cell foam core. Decks are vacuum-formed in polyester with a foam core, and there is a molded-in carbon beam forward to promote stiffness. The single-spread mast is aluminum, and our test boat flew a self-tacking North Sails jib and full-batten main with an aggressive roach. Standing rigging is wire, and deck hardware on our test boat included Lewmar blocks and tracks, rope clutches and winches, and a Harken furler for the working jib. Build quality is top-notch throughout. Seawind moved production to Vietnam out of necessity after joining forces with Corsair, which had already been successfully building boats there for a number of years. (The Aussie currency exchange rate was simply killing the company on the global market.) However, offshoring to Vietnam from Australia is a very different proposition than doing so from the United States given its close proximity, and the company has been able to do it without compromising workmanship. The first thing you notice when you step aboard the 1160 LITE are its twin helms, set against the aft bulkhead of the saloon and inboard of the stairs leading up to the side decks. I’ve long been a big fan of twin helm stations because of the clear views they afford forward and up at the rig. This particular arrangement has the added advantage of allowing you to get in from the weather and making it easy to get from one side of the boat to the other while tacking. Moving forward, the side decks are wide and clutter-free with good, molded-in antiskid and a strategically located step for accessing the cabintop. Nice, solid handholds are well positioned around both the cockpit and on the cabintop, and the triple-lifeline stanchions are an impressive 28in high. A hard targa overhead provides shelter from the weather, a perfect base for solar panels and the main traveler, a support structure for the dinghy davits, and a good work surface for shoving that big main into its stack pack. A pair of seats flanks the grill, which is set in a framework running along the back of the cockpit. 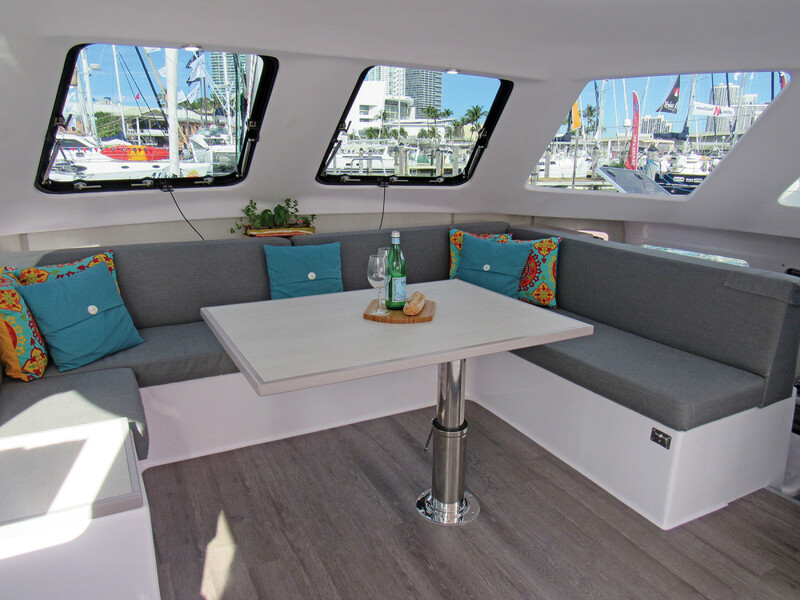 These seats proved to be immediately popular with the guests we had aboard for our test sail, and make a great spot for conversing and watching the world go by. The cockpit is separated from the saloon by Seawind’s trademark hinged “tri-folding door,” which you can fold up and then swing up and out of the way into the targa top with the help of a winch, thereby providing a seamless transition between saloon and cockpit. This is no mere porch door, but a serious piece of marine engineering that will be more than capable of standing up to dirty weather. Central to the 1160 LITE’s interior arrangement is a spacious in-line galley—complete with Eno oven/stove and Isotherm front-opening fridge—set down low in the starboard hull. This arrangement may be anathema to some cruising cat manufacturers, but in the case of the 1160 LITE, it results in an efficient, seagoing galley, with sufficient counter space for two top-opening cold-box spaces, a wealth of storage cabinets and even good ventilation, thanks to a strategically positioned hatch overhead the cooker. The arrangement also provides that much more space in the saloon for people to circulate around the dining table: which not only lowers to create a large double berth, but can be hinged and swung about into no fewer than four different configurations, depending on the number of people having dinner. A pair of hinged front windows opens up on two sets of gas struts to admit fresh air. Like the tri-folding door, these are both serious pieces of marine engineering, as befits the boat’s bluewater pedigree. Our boat featured the three-cabin layout, with a berth aft of the galley in the starboard hull and another amidships double berth forward along with a small desk/work area. The port hull housed another large double berth forward, and a shower/head setup amidships. Aft was a large storage area, which is given over to yet another berth in the four-cabin layout. Years ago I had the pleasure of sailing a standard 1160 reefed down on Sydney Harbor in squally weather with gusts in the upper 20s, and I can assure you the boat performs just as well in a blow. Despite its outboards, I would be perfectly comfortable taking this boat on coastal passages as well. Engine controls are to starboard, and, the engines are as quiet and reliable inshore as any diesel. With the throttle at three-quarter speed we had no problem maintaining a respectable 5.8 knots, which jumped to 7.2 knots with the throttle wide open. A pair of 25hp Hondas is also available. 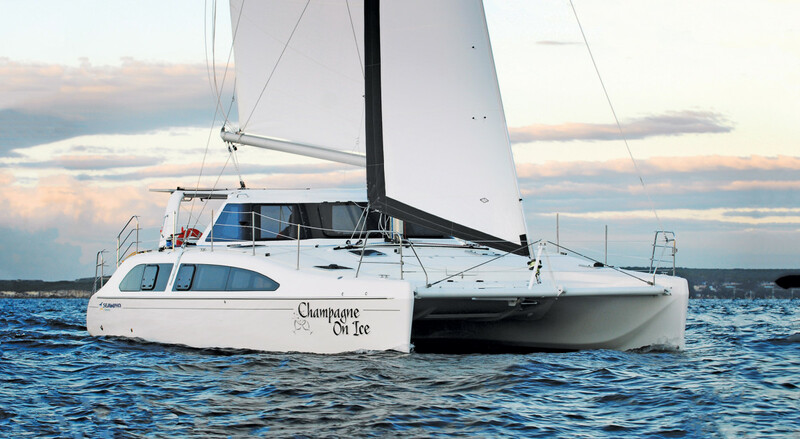 It’s a shame Seawind is based so far away and has been so hampered in recent years by Australia’s unfavorable exchange rate, because they make such great catamarans. I would love to see more of these fine-sailing boats here in the United States.